Being a group pf secular citizens who work a 9 to 5 desk job, most people are so absorbed in their busy daily routine, that they forget the charms of leading a healthy life. In this fast paced technology driven era, walking the long and tiring footsteps of a journey towards a healthier lifestyle, and achieving the perfect fitness levels is somewhat impossible. One of the major factors of a healthy and fit lifestyle is adding an exercise session to your daily schedule. However, walking toe-to-toe with the competitive world, this task is a daunting one for most of us. 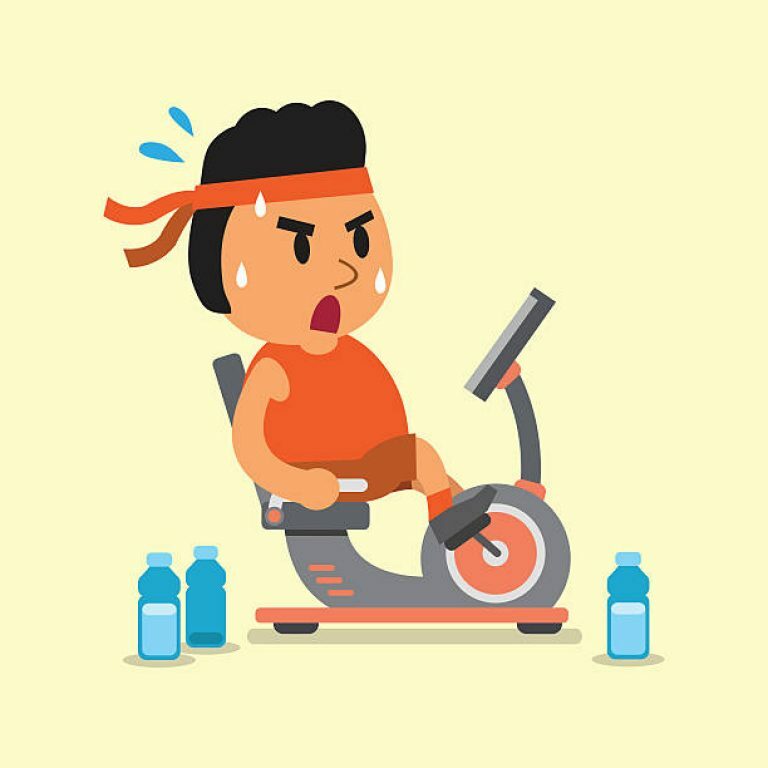 In such cases, an exercise bike can be the perfect alternative to a full-body cardio. There are different full-body exercise bikes in the marketplace, which not only offer pro-activity, but are also exceptionally affordable for each and every fitness savvy fanatic out there. One of the famous full-body exercise bikes in the market is the Schwinn AD6 Airdyne. Let us review this full-body exercise bike, and find out if it is worth your money or not! Schwinn is a US brand of bicycles, which has been in the competitive market for over a decade now. The brand was initially set-up in Chicago, and was led by a German born engineer from the front. After striving and thriving in this specific niche, Schwinn has been named one of the best brands of bicycles globally. One of their masterpieces is the Schwinn AD6 Airdyne, which has been allowing the sales charts to go through the roof. This full-body exercise bike offers exceptional technological edge to beginner’s, and can offer a full-body cardio; helping you maintain your fitness levels, weight and health alike. The Schwinn AD6 Airdyne has moving handlebars, which allows users to achieve a full-body workout, and keep their fitness levels maintained. The resistance is directly proportional with the pedaling speed. This means that the harder a user pedals, the more the resistance. This helps users in determining their own intensity of a session. The bike is equipped with dual-stage super torque drive belts, which make sure that the user can experience and smooth and peaceful experience. This full-body exercise bike offers an in-built friction-less and quiet ABS plastic fan, which keeps the surrounding pleasant. The bike has a BioSync linkage system with in-built shrouding, in order to increase the safety of the user. A water bottle holder and transport wheels have also been attached with the bike, in order to make the relocation better and easier. 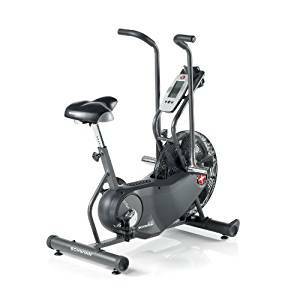 The dimensions of this full-body exercise bike are 50” L x 26” W x 51” H.
Sold with a 15 year structure guarantee, the Schwinn AD6 Airdyne is one of the few full-body exercise bikes in the marketplace, which have such a sturdy and strong structure. The parts have been well-bolted and welded together, giving out a strong performance by the bike. When it comes down the the display in an exercise bike, the Schwinn AD6 Airdyne is one of the few bikes which offers several different readings in a single display. This full-body exercise bike shows the heart rate, the speed, the distance traveled and a number of other readings, which are extremely important to keep a track of one’s progress. With a number of different resistance levels in the bike, the intensity of each and every workout has been diversified. Unlike most of the exercise bikes out there, this bike allows users to increase the resistance through the speed with which they pedal. In simpler words, the faster you pedal, the more resistance you will experience. The Schwinn AD6 Airdyne is a full-body exercise bike, which allows users to achieve fitness from head-to-toe. Apart from the pedaling system in the bike, it has also been equipped with moving arms, which intensify the training sessions. With four different leveling stabilizers equipped inside the bike, the stability which is offered by this amazing full-body exercise bike is unmatchable. The structure is quite heavy and cannot be moved easily. This also helps users in maintaining their balance over the bike; providing extra security and protection to the consumers. Apart from some of the basic optional accessories which are offered by the company, a water bottle holder and an in-built fan are the best. These two optional accessories not only keep the surrounding pleasant, but also allow users to keep themselves hydrated. Moreover, in outdoors, a water bottle holder is one of the most important accessories in an exercise bike. Primarily considered an indoor exercise bike, most users may look for a reading rack in this full-body exercise bike. However, this bike foes not come with an in-built or attached reading rack. Although the rack is manufactured separately, but it costs the users a little overhead money; which is not appreciated by some consumers. One of the main demerits of the Schwinn AD6 Airdyne full-body exercise bike is that it is not meant for extra-long workout sessions. For example, athletes spend hours on exercise bikes in order to train their body for the field. Such intense workouts need comfort as well. However, being equipped with padded seats, this exercise bike may cause soreness or body-ache after long workout sessions. A healthy lifestyle might seem like just another fantasy, when you have many other chores to look after in your day. Similarly, for people who work and spend half of their day in workplaces, the idea of entering the doors of a gym after a long an tiring day might not prove to be a good one. Such people can immensely benefit from a full-body exercise bike, such as the Schwinn AD6 Airdyne. Apart from the absence of an in-built reading rack and a few nudges hear and there, the Schwinn AD6 Airdyne can easily be tagged as one of the best full-body exercise bikes in the marketplace.